In the Marxist accounts that commonly come from the Indian press, Hindu organizations are routinely called fundamentalists, militants or even fascists. This may be surprising for the western mind, inclined to think of India as a Hindu country. But not only have states in India like Bengal and Kerala been long dominated by Marxists, most of academia and much of the English-language media has been as well. Their slanted views are often uncritically accepted by the western media as well. However, if we look at their actual views, Hindu groups have a very different ideology and practices than the political right in other countries. In fact, most Hindu causes are more at home in the left in the West than in the right. The idea of the ‘Hindu right’ is largely a ploy to discredit the Hindu movement as backward and prevent people from really examining it. The truth is that the Hindu movement is a revival of a native spiritual tradition that has nothing to do with the political right-wing of any western country. Its ideas are spiritually evolutionary, not politically regressive. Let us examine the different aspects of the Hindu movement and where they would fall in the political spectrum of left and right as usually defined in the West. The Hindu cause is similar to the cause of native and tribal peoples all over the world, like native American and African groups. Even Hindu concerns about cultural encroachment by western religious and commercial interests mirrors those of other traditional peoples who want to preserve their cultures. Yet while the concerns of native peoples have been taken up by the left worldwide, the same concerns of Hindus are styled right-wing or communal, particularly by the left in India! When native Americans ask for a return of their sacred sites, the left in America supports them. When Hindus ask for a similar return of their sacred sites, the left in India opposes them and brands them as intolerant for their actions! When native peoples in America or Africa protest missionaries for interfering with their culture, they are supported by the left. Yet when Hindus express the same sentiments, they are attacked by the left. Even the Hindu demand for rewriting the history of India to better express the value of their indigenous traditions is the same as what native Africans and Americans are asking for. Yet the left opposes this Hindu effort, while supporting African and American efforts of a similar nature. In countries like America, native traditions are minorities and thereby afforded a special sympathy. Leftists in general tend to support minority causes and often lump together black African and native American causes as examples of the damage caused by racism and colonialism. In India, a native tradition has survived the colonial period but as the tradition of the majority of the people. Unfortunately, the intellectual elite of India, though following a leftist orientation, has no sympathy for the country’s own native tradition. They identify it as right-wing in order to express their hostility towards it. They portray it as a majority oppression of minorities, when it is the movement of a suppressed majority to regain its dignity. The Hindu movement in India in its most typical form follows a Swadeshi (own-country) movement like the Swadeshi Jagaran Manch. It emphasizes protecting the villages and local economies, building economic independence and self-reliance for the country. It resists corporate interference and challenges multinational interests, whether the bringing of fast food chains to India, western pharmaceuticals or terminator seeds. Such an economic policy was supported by Mahatma Gandhi with his emphasis on the villages, reflected in his characteristic usage of the spinning wheel. Its counterparts in the West are the groups that protest the World Trade Organization (WTO), the World Bank and the International Monetary Fund (IMF). However, these protest groups are generally classified as ‘left-wing’ by the international press. The international press considers the economic right-wing to be the powers of the multinational corporations, particularly, the oil industry, which certainly are not the allies of Hindu economics. Clearly Hindu economics is more connected with the New Left in the West and has little in common with the right. The Republican right in America, with its corporate interests, would hardly take up the cause of Hindu economics either. Hindu groups are well known for promoting vegetarianism and animal rights, particularly the protection of cows. The Hindu religion as a whole honors the Divine in animals and recognizes that animals have a soul and will eventually achieve liberation. Hindu groups have tried to keep fast food franchises, which emphasize meat consumption, out of India. Such a movement would be part of consumer advocacy movements that are generally leftist or liberal causes in the West. Again it is hardly an agenda of the right-wing in America, which has a special connection to the beef industry; or to the right-wing worldwide, which has no real concern for animal rights and is certainly not interesting in spreading vegetarianism. The Hindu religion is a pluralistic tradition that accepts many paths, teachers, scriptures and teachings. One cannot be a Christian without accepting Christ or a Buddhist without accepting Buddha, but one can be a Hindu without accepting any single figure. In fact there are Hindus who may not follow Krishna, Rama, Shiva, Vishnu or other Hindu sages or deities and still count as Hindu. Hindus have been at the forefront in arguing for the cause of religious diversity and the acceptance of pluralism in religion, rejecting the idea that any single religion alone can be true. This Hindu idea of religion—which is also subscribed to by so-called right wing Hindu groups like RSS—is obviously not part of the agenda of the religious right in the West. The American Christian right is still sending missionaries to the entire world in order to convert all people to Christianity, the only true religion. It is firmly fixed on one savior, one scripture and a rather literal interpretation of these. Yet when Hindus ask the pope to make a statement that truth can be found outside of any particular church or religion they are called right-wing and backwards, while the pope, who refuses to acknowledge the validity of Hindu, Buddhist or other Indic traditions, is regarded as liberal! Such pluralism in religious views is hardly a cause for any right-wing movement in the world, but is also considered progressive, liberal, if not leftist (except in India). Unlike the religious right in the West, the Hindu movement is not against science or opposed to teaching evolution in the schools. Hinduism does promote occult and spiritual subjects like astrology, Ayurvedic medicine, Yoga or Vedanta, but these are the same basic teachings found in the New Age in the West, generally regarded as a liberal or leftist movement, not those of the religious right in the West. Many leaders of the Hindu movement are in fact scientists. For example, RSS leaders like former chief Rajinder Singh, or BJP leaders like Murli Manohar Joshi have also been professors of modern physics. The Hindu movement sees the union of science and spirituality as the way forward for humanity, not a return to medieval views of the universe. The Hindu right is often defined in the media in terms of caste, as favoring the upper castes over the lower castes. This is another distortion that is often intentional. Modern Hindu teachers have been at the forefront of removing caste. This includes great figures like Vivekananda, Mahatma Gandhi and Aurobindo. It includes major Hindu movements like the Arya Samaj, the largest Vedic movement in modern India, and the Swadhyaya movement. The Hindu movement can be an ally for any native causes, environmental concerns, women’s spiritual issues and movements toward economic simplicity and global responsibility, to mention but a few. The VHP, the largest so-called Hindu right wing group, rejects caste and works to remove it from Hindu society, giving prominence to leaders from lower classes and working to open the Hindu priesthood to members of all castes. While caste continues to be a problem in certain segments of Hindu society, it is generally not because of these current Hindu social, religious and political movements, but because their reform efforts are resisted. The real social problem in India is not simply caste but jati, which refers to family, clan, community and regional interests. Many so-called anti-caste movements in India, including those honored by the left (like movements of Laloo Prasad Yadav) actively promote the interests of one community in the country over those of the country as a whole. Generally, the right wing in the West is defined as opposed to women’s rights. However, there are many women’s groups and active women leaders in the Hindu movement and in the Hindu religion. Being a woman is no bar for being a political or religious leader in India as it often is in the West. 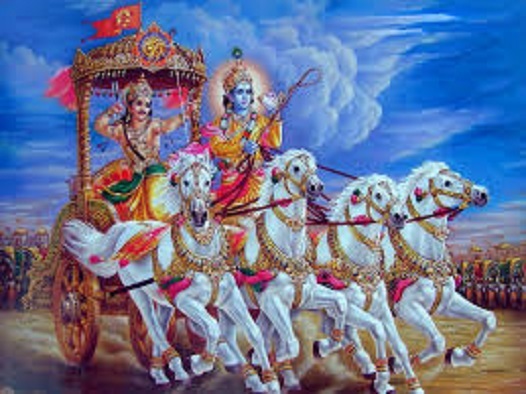 Hinduism has the worlds’ largest and oldest tradition of the worship of the Divine as Mother, including as India itself. Great female Hindu gurus like Ammachi (Mata Amritanandamayi) travel and teach all over the world. The Hindu movement worships India on a spiritual level as a manifestation of the Divine Mother (Shakti). In India, the political terminology of right and left is defined by Marxists, who like to call anyone that opposes them right-wing or fascists. According to their view anything traditionally Hindu would have to be right-wing on principle, just as only their views are deemed progressive, even if supporting Stalinist tactics. This means that in India such subjects as Yoga, natural healing, vegetarianism and animal rights are all automatically right-wing because they are causes of the Hindu mind, with antecedents in ancient Indian culture. Great Hindu yogis and sages from Shankaracharya to Sri Aurobindo are classified by modern Marxists as right-wing, if not fascist. However, the Indian left is mainly the Old Left, emphasizing a failed communist ideology and state economic planning such as dominated Eastern Europe in the decades following World War II and took it nowhere. It wreaked the same havoc with the economy and educational systems of India and kept the country backward. Indian communists are among the few in the world that still proudly honor Stalin and Mao (while warning of the danger of Hindu fundamentalism)! Communist ruled Bengal still teaches the glory of the Russian revolution for all humanity, though Russia gave up communism ten years ago! The Old Left was itself intolerant, oppressive and dictatorial, sponsoring state terrorism and genocide wherever it came to power. Indian leftists have never rejected these policies and look back with nostalgia on the Soviet Union! Modern Hindu teachers have been at the forefront of removing caste. This includes great figures like Vivekananda, Mahatma Gandhi and Aurobindo. It includes major Hindu movements like the Arya Samaj, the largest Vedic movement in modern India, and the Swadhyaya movement. The causes taken up by the Hindu movement are more at home in the New Left than in right wing parties of the West. Some of these resemble the concerns of the Green Party. The Hindu movement offers a long-standing tradition of environmental protection, economic simplicity, and protection of religious and cultural diversity. There is little in the so-called Hindu right that is shared by the religious or political right-wing in western countries, which reflect military, corporate and missionary concerns. The Hindu movement has much in common with the New Age movement in the West and its seeking of occult and spiritual knowledge, not with the right wing in the West, which rejects these things. Clearly, the western right would never embrace the Hindu movement as its ally. To counter this distortion, some Hindus are now arguing for a new ‘Hindu Left’ to better express the concerns of Hindu Dharma in modern terms. They would see the new left as more in harmony with Hindu concerns and a possible ally. Hindu thought has always been progressive and evolutionary, seeking to aid in the unfoldment of consciousness in humanity and not resting content with material or political gains as sufficient. Hindu Dharma should be reexamined by the new left and the distortions of by the old left discarded. The new left will find much in Hindu Dharma that is relevant to its concerns. The Hindu movement can be a great ally to many social movements throughout the world. It has a base of nearly a billion people and the world’s largest non-biblical religious tradition, with a long tradition of spiritual thought and practice. The Hindu movement can be an ally for any native causes, environmental concerns, women’s spiritual issues and movements toward economic simplicity and global responsibility, to mention but a few. However, the entire right-left division reflects the conditions of western politics and is inaccurate in the Indian context. We must give up such concepts in examining Indic civilization, which in its core is spiritually based, not politically driven. It reflects older and deeper concerns that precede and transcend the West’s outer vision. As long as we define ourselves through politics our social order will contain conflict and confusion. Democracy may be the more benign face of a political order, but it still hides the lack of any true spiritual order. We must employ the vision of dharma and subordinate politics to it, which should be a form of Karma Yoga.